The sketch for the challenge at Splitcoast today lends itself to so many different looks. 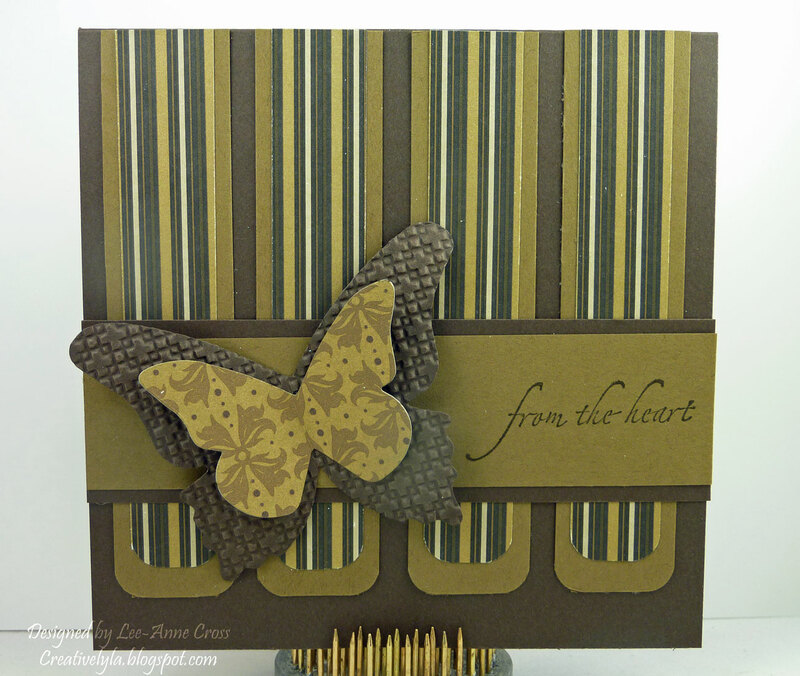 I’ve made my card base 5″ x 5″ square in Stampin’ Up Early Espresso. Next comes some strips of Soft Suede where I rounded the bottom corners. On top of those strips I’ve layered some designer paper with the same rounded corners. A strip of Early Espresso placed horizontally across the card, with a smaller strip, again in the Soft Suede over top. I’ve stamped the sentiment to the right of this strip in Early Espresso. The two layers of the butterfly were cut with a die. The bottom layer, in Early Espresso, was dry embossed and the top layer is the reverse side of this beautiful paper. A simple card that could be used for many occasions.